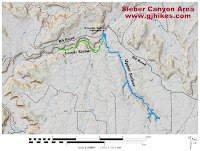 Lower Sieber Canyon is located in the McInnis Canyons National Conservation Area near Grand Junction, Colorado. The canyon is close to but not part of the Black Ridge Canyons Wilderness Area. 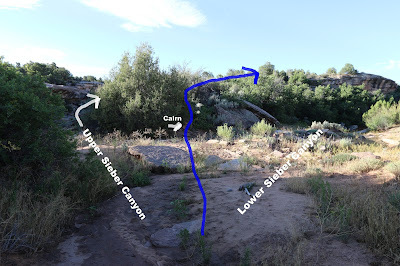 Hiking in the upper portion of the canyon is very primitive with no official trails to follow. 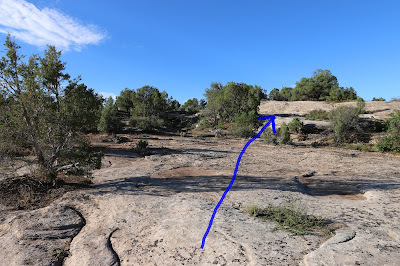 This post follows a route that takes it down a slide to get around a giant spillover and into the main wash of the canyon where it continues for 1 mile to a panel of petroglyphs that cover about an one hundred foot section of cliff. To get to the trailhead find your way to Glade Park and turn right at the store onto 16 1/2 Road. Follow it for a half mile and turn left onto B South. Once you turn onto B South it is another 11.5 miles. The pavement will end after the first 3 miles. Just before the 10 mile point the road crosses a cattle guard and enters the McInnis Canyons National Conservation Area. Continue following B South for another 1.7 miles. Look for a place to park on the left a short distance past the Knowles Canyon trailhead. During dry weather when the road is in good condition it is passable by careful drivers in regular passenger cars. Something with a little bit of ground clearance would be best and if the road is muddy everyone should stay off of it. From the parking area find a route down the hill into the wash and follow it a short distance to where it forks. The fork to the left heads up Sieber Canyon while the right fork leads downstream. There is a large spill over a short distance downstream so to get into that part of the canyon requires hiking around it. Look for a cairn that marks a good spot to climb out of the wash on the other side. 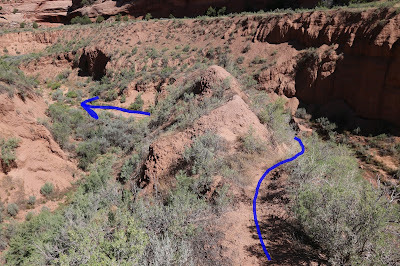 Once the trail gets out of the wash it comes to a section of slickrock where there isn't really any obvious route. If you climb up to the higher section of slickrock you should be able to pick up a well worn path that heads in the correct direction. This part of the mesa is braided with all sorts of trails. Some of the trails tend to suddenly disappear. 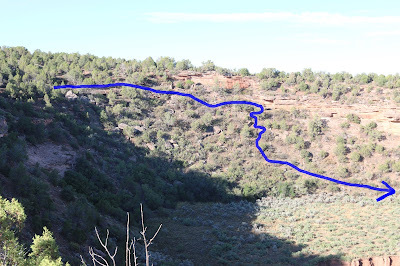 The idea is to not get too far away from the canyon on the right so that you don't miss the drop in point. The canyon walls near the spillover are vertical drops of several hundred feet. The best way down into the canyon is around the 0.7 mile point from the trailhead. There are a few cairns here and there that mark some of the route but the best bet is to find a spot where you can see the drop in point and work your way in that direction. The slideshow at the end of this post should give a general idea of the route that we took and some of what you might expect to see. In the past we have taken several different routes down the hill into the canyon. The best route though angles steeply down the west side of the slide. The trail is steep with no shortage of loose rock but there isn't a lot of brush to fight through like there is in other places. Once you get down the slide there are several routes that you could follow to get down into the wash in the bottom of the canyon. One is to head up the canyon toward the spillover and find a place to drop down into the wash from there. We have gone that way in the past but for this post we are heading down the canyon through the greasewood staying close to the hill on the left for the most part. Staying closer to the wash would work also as long as you are careful not to get too close and have the bank give way under you. 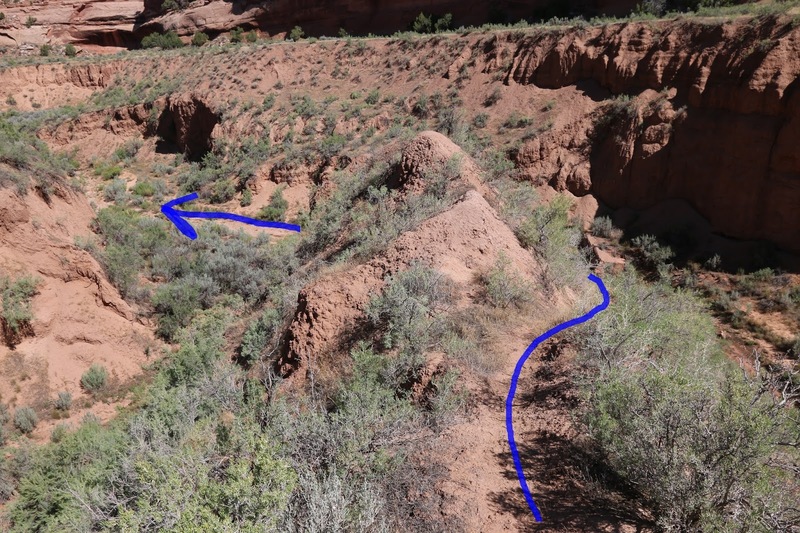 As you head through the greasewood there is a side canyon that comes up with another big spillover. Once you see the side canyon turn toward the main wash. There is a good trail that drops off of the point where the two washes come together. Following the route that we took we were in the main wash right around the 1.1. mile point. From there is is almost exactly 1 more mile to the petroglyphs. This photo is looking back toward the wall with the petroglyphs on it after having left the wash at the 2.1 mile point. Once you get out of the wash you can see some of the petroglyphs in the area of the cliff above the small mesa. Since the time the petroglyphs were made the small mesa has sunk into the wash about 10 feet leaving a lighter band of cliff below the images. One of the first images on the west end is of a large owl. All the way down at the east end of the panel there are two more owls mixed in with some other images. It is possible that the owls are a clan symbol although except for the eyes and beak each one is made slightly different from the others. There are also some bear paws near the middle of the cliff that at times are meant as clan symbols. Here is a hunting seen. Possible warriors or kachina although they remind me a lot of the movie Predator for some reason. Cowboys used to have a bad habit of shooting at petroglyphs. Unfortunately they hit this one right in the chest where it looks like there was some type of sun shield. Several of the figures appear to be holding a knife like this one does. It should go without saying that it is illegal to cause harm of any kind to rock art or to disturb or damage any archaeological site. 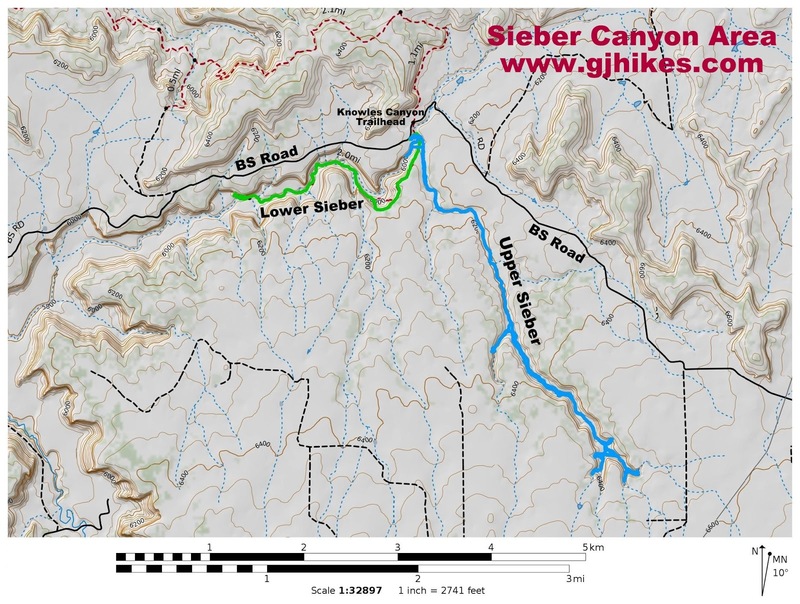 The first time that we set our sights on exploring Sieber Canyon below the spillover we used Google Earth to find the drop in point. Once there we found that it seemed to be a route that was used occasionally in the past. 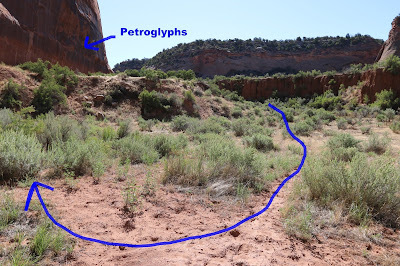 We should mention that if you go much further down the canyon past the petroglyphs that you will hit private property. There are purportedly more petroglyphs in that part of the canyon but it would require special permission from the landowner before trespassing. We have explored pretty much all of the canyon from the petroglyphs shown here all the way up to the big spillover on past trips without coming upon anything all that interesting. The route is very primitive for this hike but if you would like to see it for yourself then all you have to do is 'Take a hike'.